There are different rock forming processes, and those determine the classification of rocks. Rocks are classified using 3 main categories: sedimentary, igneous and metamorphic. High pressures and temperatures are needed for the metamorphic rock forming process. These extreme conditions are found inside the earth . Sedimentary rocks, however, are usually formed on the seabed. That means that rocks are classified according to their origins. The actual chemical composition is not a criterion for classification, as most rocks have the same basic structure, which consist of silicates (silicon dioxide). Quartz, for instance, can be igneous or metamorphic. Igneous rocks (65% of all rock) are formed from the solidification of magma, which is the material that fills most of the volume of the planet. Magma is molten rock and when it comes to the surface it is called lava. The name igneous suggests this high temperatures, as igneous means fire (for example, ignition). The magma is a big soup of minerals. It cools down when it approaches the crust, and various minerals start to form (crystallization). The rate of cooling determines many properties of igneous rocks. 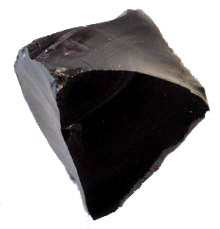 The presence of glass, for instance, indicates that the magma has cooled very quickly. Igneous rocks can be classified as extrusive or intrusive .Extrusive igneous rocks are formed when the magma rises straight to the surface. A rapid cooling takes place , which result in the formation of minerals (crystallization). The rate of cooling of a stone is reflected in many of its properties, like grain size, for instance. When the magma intrudes in the crust, it is submitted to to conditions that cause metamorphism, before it is driven to the surface. Uplift is the mechanism that drives rocks to the surface and it is also responsible for the formation of mountains. The rocks go up because of the lower density of the deep rock, when compared to the cooler rock just above. Pink granite is the commonest of all intrusive igneous rocks. Its a coarse grained rock. There are also other kinds of granite. Granite is an acid rock. Intrusive rocks are also known as plutonic. Intrusive rocks are coarse grained whereas extrusive ones are fine-grained. The rapid cooling that happen during extrusion doesn't permit the formation of the large crystals (grains) observed in granite. All kinds of rocks can be uplifted. Sedimentary rocks (8% of all rocks) are made out of sediments (sand,clay and animal and plant remnants) that are transported and deposited by air and water. Most sedimentary rocks form on the sea bed. These material is buried and the mounting pressure squeezes water out and the grains are cemented together. A typical example is sandstone, which consists of cemented grains of sand. 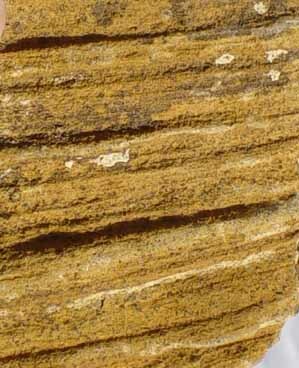 Sandstone (shown on the left) displays a number of layers which correspond to different periods of deposition. The lowest layers are the older ones, going back thousands or millions of years. Shale is formed from squashed mud. It can be heated to release a substance similar to crude oil. This process is carried out in various countries. 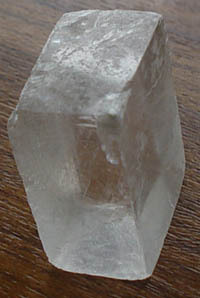 Flint, a very hard stone found in chalk, which was used to make the first tools ever produced by man. Amber, which is a fossil resin of extinct trees, often used in jewellery making (it is considered a gemstone). Peat, which is the first stage in the transformation of organic sediments into coal.It is a soft rock. 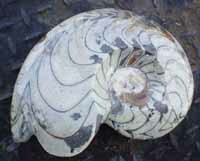 Limestone, which is found in various different types, most of them formed by the decomposition of skeletons of sea creatures like shellfish. Any rock can turn into a metamorphic rock when subjected to extreme heat and pressure. Origin of the name: Meta means change of position or condition. Examples are metabolism, metaphor, metaphase (cell division). Amorphous means shape. Hence, metamorphism means changing shape. Metamorphism is a transformation of the crystalline structure of the rock, without melting. That means that the atoms rearrange themselves and change their relative positions. The overall chemical structure of the rock remains the same. That means that metamorphic rocks form out of pre-existing rocks. This gives some insight on the importance of the crystalline structure for the properties of a material. 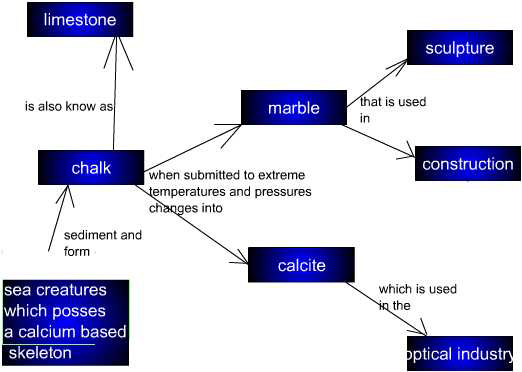 For instance, the transformation of chalk to marble. The same atoms are there, but in a different arrangement. The properties change drastically. You may think that substances made of pure carbon are black, because coal is black and graphite is also black. Those are common forms of carbon. Diamond, however, that is also made purely of carbon, is transparent and very shiny. Likewise, chalk is white and calcite (one of the crystalline forms of calcium carbonate) is transparent. 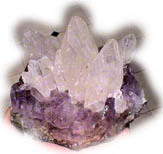 Calcite is used in the optical industry because it possesses very interesting properties. Calcite is birefringence. Learn more about birefringence here.